Dogs are denning animals. In nature, wild dogs use dens to sleep, escape from danger, and to raise a family. Providing your puppy with a crate allows him the same solitude, a place to call his own and to "get away from it all." It is also a useful tool in housetraining a puppy and for keeping him safe when you're out running errands. In this post, we will review how to crate train your dog (it's really not all that difficult). 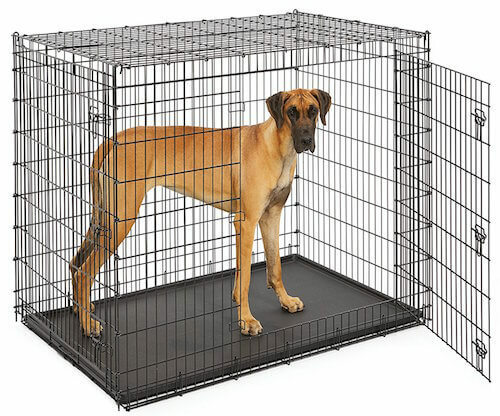 Your dog's crate should be just roomy enough for him to stand up, turn around, and lie back down again. If you have a large breed puppy that is still growing, your best bet is to purchase a metal pen with a movable inner "wall." This will allow you to expand the crate as needed. Remember, giving your puppy more crate space will enable him to "do his business" at the back and sleep at the front. Crate training your dog can be a lengthy process and is very dependent on each individual dog. To help the process go smoothly here are some simple steps to help you along the way. Place the crate in an area of your home where your family spends the most time. Take the door off the crate and place a soft blanket or towel on the floor of it to make it comfy. Your dog may be naturally curious and wander into the kennel right away, some dogs even enjoy it and will choose to use it for their naps. Bringing them to the crate and encourage them in a happy voice. Motivating your puppy with dog treats by placing them beside the crate, then closer and closer until they are inside the unit. If your puppy is reluctant to follow the food, don't force him. Continue with the treats until your pup is walking in and out of the crate calmly. Treats not working? Try a favorite toy. Creating a pleasant time for your puppy when it comes to the crate is paramount. You can do this by feeding your furry pal beside the kennel. Once your dog is comfortable entering the crate, you can place his food dish all the way at the back of the crate. However, if your pooch is still reluctant to enter the crate, try placing his dish only as far as he is willing to go without fear or anxiety. As his fear is alleviated, you can gradually move the dish back. If your dog is comfortable, close the crate door while he eats. If he whines, open it and let him back out. The goal is to create a feel-good situation while getting him used to being crated. As your puppy learns the crate is not a "bad" thing, you can increase the time he spends inside the crate with the door closed. While you are home, practice crate training. Give your dog a treat and give the command "crate or kennel," while pointing to the unit. When your pup enters the kennel, praise him and reward with the treat. Close the door and sit quietly by the crate. If your pup is fine, leave the room for a few minutes, then return and sit quietly. If all is well, increase the time you are away. Once you have reached the point of 30 minutes with you out of sight, you can start leaving your puppy while you're away on short errands and/or letting him sleep in the crate at night. Note: This process may take several days or even weeks. Crate training should never be a bad experience for your canine companion. Here are some no-no's of using a crate that you will want to avoid. Never use the crate as a punishment. This will only cause fear, and he will refuse to enter it. Never leave your dog in the crate too long. Kenneling your pup all day and all night is cruel. You may need to change your schedule, hire a pet sitter or take your dog to a daycare facility. If your puppy is under six-months-old, he shouldn't spend more three or four hours at a time locked inside the crate. Dogs at this age cannot control their bladders and bowels for that long. Crate your dog only until you can trust them not to destroy the house. After that, it should be a place they go voluntarily. Crate training is an excellent way to help housetrain a puppy and to give your dog a place to call his own. You will know you have crate trained your dog well when he uses it as a retreat without fuss or bother. Follow these steps, be patient and remember always to praise and reward your puppy for a job well done.